I'm super excited to have this guest post recipe! This is a super delicious, quick and easy dinner that you can prepare on one sheet pan. The one sheet pan dinners are Ruthy's specialty! Hi all! I’m Ruthy, popping over from PercolateKitchen, where I share weeknight recipes and simple routines for working parents. One of my favorite styles of easy weeknight recipes is sheet pan suppers. You might say I’m a little obsessed! I think there’s nothing cooler than being able to toss a bunch of ingredients and some seasonings on a sheet pan, pop the whole thing in a hot oven, and sit down to dinner roughly 20 minutes later. It’s the ultimate in one-pan cooking! I also love finding new meat-free recipes that are hearty enough to eat for dinner and kid-friendly enough that my toddler and preschooler don’t turn their nose up at it. The struggle is real, moms. 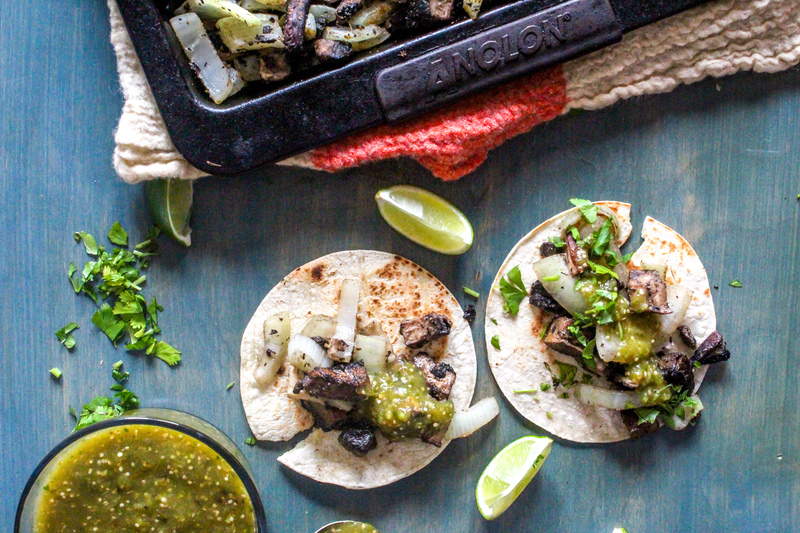 So when I started tinkering around in the kitchen to find a great recipe to share here on Hippie Dippie Mom, I settled on a big sheet pan of roasted mushroom tacos and felt like I’d hit the lottery! I love portobello mushrooms because they’ve got a meaty texture, and they hold up great when roasted. Paired with sweet onions and a Mexican-inspired dry rub, you’d be forgiven for forgetting you were eating vegetarian! Don’t be afraid to use foil covered with parchment paper. Speaking of foil, if you have some ingredients that can cook in sauce, wrap those up in foil and “steam” them on the same pan that holds roasting vegetables. It’s the ultimate in two for one. Hot ovens are the best ovens. Cook the protein and veg in the oven and make the starch on top. Make sure all ingredients are the same size or will cook at the same speed. Failing that, don’t be afraid to use two sheet pans in the oven at once and remove one. It can feel like it takes some balance, but you’ll get it once you’re more comfortable with the idea of sheet pan dinners. You’ll get a great caramelization on the veg by heating the sheet pan in the oven before you add the ingredients to it. Think of it as adding vegetable to a sizzling hot pan on the stove! Cook the two pans at once so you can utilize the hot oven while also using the stovetop. These also make great nachos if you’re not in the mood for tacos! That’s pretty much it! Once you get the hang of sheet pan dinners, the whole dinnertime routine opens up to you. We talk about them a LOT, and swap recipes too, in my Facebook group, Busy Mamas Cooking in Tiny Kitchens. If you’ve got a recipe you want to try out, or if you’re new to the idea of sheet pan suppers, come join us in the group! Ruthy Kirwan is a recipe tester, recipe developer, and cooking class instructor living in NYC with her husband and 2 small children. She’s on a mission to make weeknight cooking less overwhelming for working and busy parents! click here for tips, resources and games that will help you raise a healthy kid! Preheat the oven to 400*F.
Toss mushrooms, onions, seasonings and oil in a large bowl until coated. Spread the mushroom mixture on a sheet pan in an even layer. Roast for 10 minutes until the mushrooms and onions have softened. While the mushrooms are roasting, slice each tomatillo in half. Heat a large, stainless steel or cast iron pan over high heat. Place the tomatillos cut side down on the pan and arrange the garlic cloves and jalapeno on the sides. Cook 3-4 minutes, turning once or twice to brown on each side, until the tomatillos have softened and begun to wilt. Remove from the heat and transfer contents of the pan to a food processor or blender. Add the cilantro and lime juice and process until smooth. If desired, toast the tortillas on a dry pan until lightly browned. Fill the tacos with the mushrooms and onions, then top with salsa verde and garnish with remaining chopped cilantro and a squeeze of fresh lime. Make sure the sheet pan you use to roast the mushrooms is a heavy, sturdy one; this prevents any accidental burning while in the oven. If you don’t have a blender or food processor, you can chop the salsa verde ingredients together to form a chunky salsa instead. Sharing is caring! Post your fave image to Pinterest!